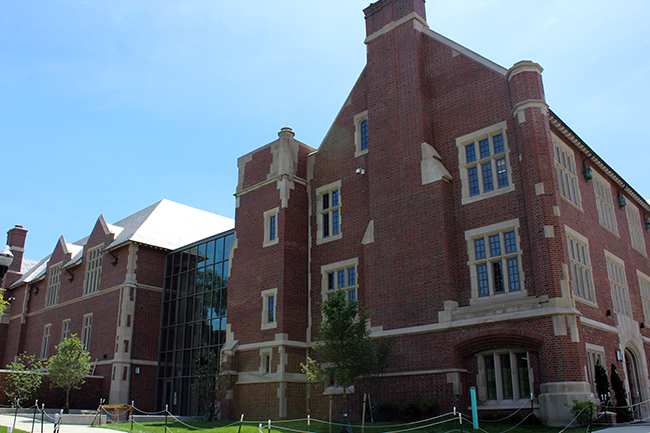 The arts and sciences are converging at the newly renovated Pomerene Hall on Neil Avenue, which now houses the Department of History of Art and the undergraduate data analytics major, as well as Ohio State’s Translational Data Analytics Institute. Located in the revived Mirror Lake District, Pomerene Hall has long been an emblem of campus. Its roughly $60 million renovation — most of which was funded by the state of Ohio — is the building’s first major update in nearly a century. “There was plaster falling from the ceiling in the hallways … in general the building looked and felt pretty neglected,” said Lisa Florman, professor and chair of the Department of History of Art, which was located in Pomerene Hall from 2010 until renovations began in summer 2016. Built in 1922, the hall originally served as a women’s student union, complete with a gymnasium and a swimming pool. In recent years the iconic building saw little use for its size. The history of art main office, seminar spaces and graduate student reading room have largely been kept intact, and an updated faculty suite and new undergraduate study room will breathe new life into the department, Florman said. For the undergraduate data analytics major — now in its fifth year — the renovation provides the program’s first dedicated physical space on campus. “Because the major is interdisciplinary, the students have never had a space that was their own,” said Brooke O’Leary, academic planning specialist for the data analytics major. The data analytics program was created in 2014 in response to a quickly growing need for versatile data scientists, and, while the program is housed within the Department of Statistics at the College of Arts and Sciences, curricular partnerships exist between the College of Engineering, the College of Medicine and the Fisher College of Business. The major’s new home in Pomerene features a student lounge space, a tutor room, two computer labs, several lecture halls and an advising office. 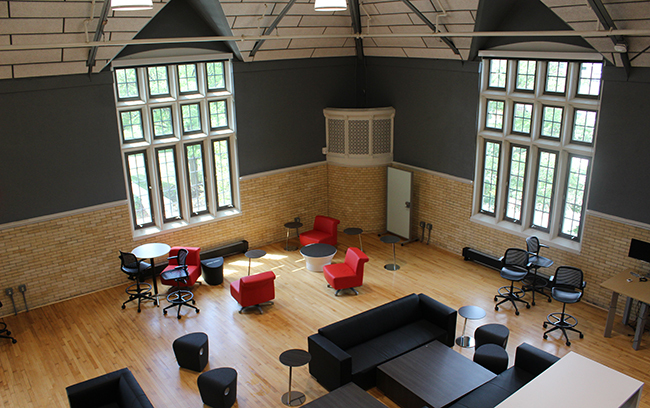 Pomerene’s former gymnasium has been transformed into an “Ideation Zone” — a massive collaborative space for the Translational Data Analytics Institute — with movable furniture, meeting spaces and cutting-edge labs for building hardware, testing software and conducting large-scale data simulations. All of these advances lie upon 90 percent of the original wood floor. 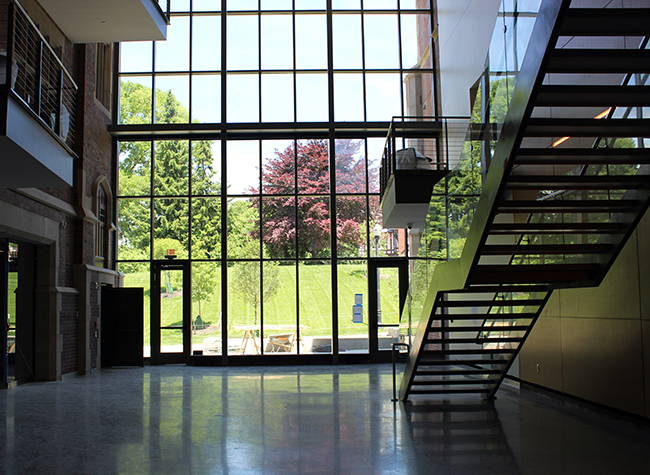 A new, three-story atrium and glass wall serves as a modern intersection between the two main wings of the building. A portion of the renovation costs went toward other restorations within the Mirror Lake District, including updates to Oxley Hall and the Browning Amphitheater. The finished project is another stepping stone in the university’s Framework 2.0, a long-term vision for the transformation and revitalization of Ohio State’s physical campus to help strengthen Ohio State’s position as one of the world’s most important and effective centers of teaching and research.